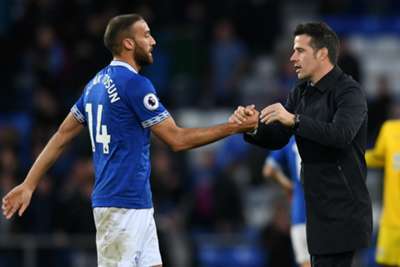 Marco Silva downplayed his role in choosing Everton's substitutes after Dominic Calvert-Lewin and Cenk Tosun sealed a 2-0 win over Crystal Palace off the bench. Palace should have taken the lead after an hour when Wilfried Zaha was fouled by Seamus Coleman in the penalty area, but Jordan Pickford saved Luka Milivojevic's subsequent penalty. Everton then punished that miss, as Calvert-Lewin met the cross of fellow substitute Ademola Lookman to put the hosts ahead with three minutes left to play. Tosun – introduced 15 minutes earlier than the other two – then got Everton's second after catching Palace on the break. But Silva brushed off any personal praise. "It's our job," he told Sky Sports. "We are here to make decisions not just on the line-up, but in the game as well. "It was all okay when we changed the three players and it worked. I am really happy for them. "Cenk in the last two home games has come on and scored goals and Dominic and Lookman have come on and created the first goal. "They are working really hard to make the starting line-up. It's important to us to have solutions on the bench to solve problems in a match." | A penalty save at a crucial time. A clean sheet. Always vital to the win. Palace manager Roy Hodgson felt the result was harsh on his team, however, convinced they were even deserving of a win. "Two goals in the 87th and 89th minute, the first one is the killer, the second one is one you concede when pushing forward," he added. "The first goal was such a massive blow, having put ourselves in the game and having the chance to score and not being able to take that. "It's hard to stand here as a loser again. I could easily have been standing as a winner, or at least coached my team to a positive point, but they scored the goals and we didn't. "We matched Everton – they're a hard-working team too. The mood in the dressing room is very sombre because we were very close to getting a good result that nobody would have begrudged us."